The NHL is working to grow hockey in China with the league and teams hosting training clinics and playing pre-season games in the country. SHANGHAI — China's first NHL game did not impress everybody. JOJO, a Chinese internet star who was covering the game for iQiyi, a popular Chinese online video platform, left after the first period of the Sept. 21 pre-season tilt between the Los Angeles Kings and Vancouver Canucks at Mercedes-Benz Arena in Shanghai. "It was cold," she told NBC News. While China may still have a lot to learn about ice hockey, the NHL appears ready to teach. "The game of hockey has treated me very well. Hopefully, it can get ingrained in another culture. If I can help one kid here enjoy the game as much as I do, that's a pretty cool thing." Over the last three years, the Kings, Canucks, Boston Bruins, Montreal Canadiens, New York Islanders, Toronto Maple Leafs, and Washington Capitals, along with the league itself, have held regular youth and coaching clinics in Shanghai, Beijing, and other Chinese cities. "But now, we're being more aggressive about having a number of clinics throughout the country," David Proper, the NHL’s executive vice president of international strategy, said. According to Proper, the league will host upwards of 15 youth clinics all over China this season, which at least doubles last year's presence. This figure doesn't include the coaching and team-run clinics. The NHL will also work with the Beijing Ministry of Education to introduce ball hockey into schools. “We understand that to grow the sport here in China, we do have to invest in the infrastructure, from children on up,” Bill Daly, the league’s deputy commissioner, said. "We want more kids playing hockey," Kings president Luc Robitaille added. This is just the beginning for the NHL in China. Along with these league and team-initiated grassroots efforts, Proper said that the NHL has entered into an agreement with Bloomage International Group, a Chinese-based corporation focused on developing sports nationwide, to play a minimum of six times over the next eight years in the country. Those figures include this recent foray into Shanghai and Beijing. 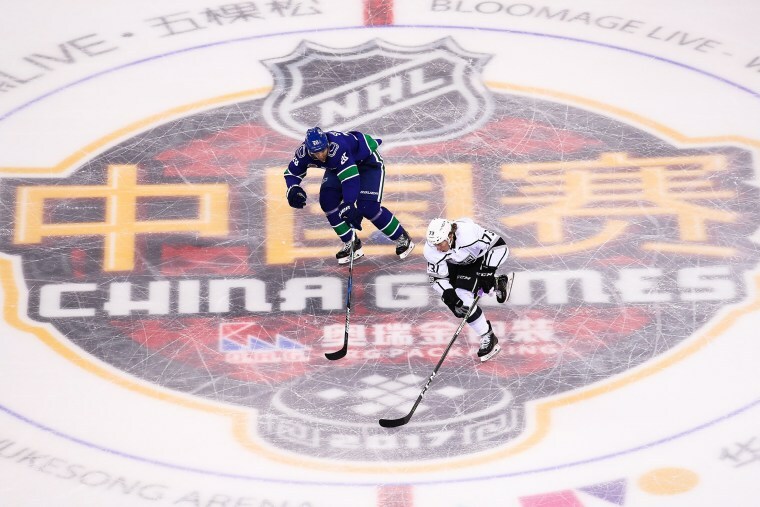 The NHL is not the only hockey league that’s eyeing the Chinese market. The Russia-based Kontinental Hockey League, widely considered to the world’s second-best hockey league after the NHL, established China’s top professional team, the Kunlun Red Star, just two years ago. Mike Keenan, Kunlun’s head coach, has previously told NBC News that China will build 1,000 ice rinks by 2022, about four times more than the current number. Each year, these fresh sheets of ice are expected to introduce 100,000 kids to skates. All roads seem to lead to the Beijing Winter Olympics in 2022. While the NHL decided not to take a mid-season break so that players could participate in the PyeongChang Winter Games this February, it's presumed that the league cannot afford to miss out on prime exposure in the world's largest economy in 2022. Kings and Canucks players, who had been whisked thousands of miles away from their already-strenuous normal preparation for the regular season, seemed to realize what was at stake for the league, and potentially, their own pocketbooks. "This is a gold mine," Canucks defenseman Erik Gudbranson said. "You've seen it with basketball. It's huge. [Kobe] is a mega-star here," Kings defenseman Alec Martinez said. "We could follow in the NBA's footsteps and do some of the same things." But for now, it's a tough sell for a country mostly unfamiliar with ice hockey. On Sept. 21, an announced 10,088 dotted Mercedes-Benz Arena in Shanghai, capacity 18,000. Two days later, an announced 12,159 watched the Kings and Canucks face off again, this time at Cadillac Arena in Beijing, capacity 18,000. In contrast, a pair of early October National Basketball Association (NBA) exhibitions between the Golden State Warriors and Minnesota Timberwolves, which included a match-up at Mercedes-Benz Arena, sold out within an hour after tickets went on sale, according to a spokesperson from NBA Asia. In the bigger picture, China currently has 1,101 registered adult and youth hockey players, according to the International Ice Hockey Federation. As far back as 2006, Hu Jiashi, then-vice president of the China Basketball Association, estimated that 300 to 400 million Chinese either regularly play or watch basketball. Canucks president Trevor Linden believes that the NHL is prepared for this uphill battle. "I think the NHL's plan here is a consistent, well-developed plan on many fronts," he said. "It needs to be a long-term commitment." For Martinez, it's just about taking it one step at a time. "The game of hockey has treated me very well,” the defenseman said. “Hopefully, it can get ingrained in another culture. If I can help one kid here enjoy the game as much as I do, that's a pretty cool thing."